Advancing into the quicker Formula 3 car, Kiern will be using a 2-litre, 230bhp, Tatuus-Cosworth BRDC British F3 Car – a jump of 70bhp compared to last year’s F4 car. Dominating the 2018 British F4 Championship in his debut season, Kiern finished the year as Champion with a record-breaking number of points, podiums and winning margin. This success saw the 16-year old become a member of the BRDC Rising Stars scheme, Motorsport UK Academy Team UK and the youngest-ever nominee of the McLaren Autosport BRDC Young Driver of the Year Award. 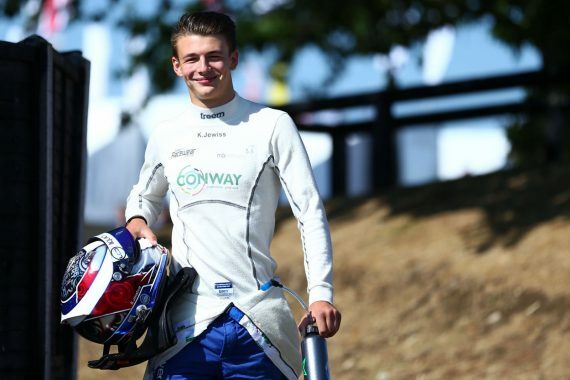 Reigniting the winning partnership from 2017, Kiern Jewiss will rejoin Douglas Motorsport two years after they first teamed up for Kiern’s maiden season in cars when he was crowned Rookie Champion in the Ginetta Junior Championship – with Douglas Motorsport finishing the year as the Teams’ Champion. For the 2019 season, Kiern will once again fly the flag for FM Conway as the ‘Green Arrow’ returns for another year of on-track action and will also be representing Morgan Bros as he takes on the next challenge in his career. Looking ahead to the BRDC British F3 season, Kiern is delighted to be joining Douglas Motorsport and has set high expectations for himself. Wayne Douglas, Douglas Motorsport, is delighted to have the reigning British F4 Champion join his team for the year ahead. Mark Blundell, MB Partners’ CEO, sees this as a huge opportunity for Kiern to build on his career successes. The BRDC British F3 season kicks off in April (20-22) with the first round of the season at Oulton Park as the series co-headlines with British GT. This entry was posted	on Wednesday, January 23rd, 2019 at 12:00 pm	and is filed under Featured, Motor Racing. You can follow any responses to this entry through the RSS 2.0 feed. Both comments and pings are currently closed.